Should you create your organization page under your personal Facebook account? Or use a separate email address and create a business-page-only account? This question comes across my inbox a LOT—maybe more than just about any other question. With the permission of the original sender, I wanted to reprint the question (and provide an answer) here so everyone can get this information. The question is broken into several pieces, because (as with most things Facebook) it’s a complicated, multi-part issue! So let me first address this, because it’s a decision we all have to make. What happens if we add someone as an admin, and then they get mad at us, and delete US as an admin on our own page? What happens if they delete our page all together? This seems like the logical thing to do. It makes sense to want to keep your business accounts separate from your personal accounts. However, in Facebook-land, this is NOT the way to go about things. For better or worse, Facebook wants you to administer your pages via your profiles (i.e., your organization page should be managed by your own personal account). It IS possible to create a new business page with a separate email address, that is completely separate from yours or any other personal account. But this is not a good idea, for a few reasons. First, if you do this—if you create a separate account that is not associated with any personal profile, you will have very limited ability to function and interact on Facebook. For example, you will not have access to the “search” feature at all. This means you won’t be able to interact with any other pages on Facebook or find anything without knowing the exact URL. Since the whole point of Facebook is to interact, not just post in a vacuum, if you set up your page this way you will not be able to use Facebook in its fullest. You may feel this is more secure than having multiple staff/volunteer accounts as managers of your page. But if you set your page up in this way, you’ll have to give everyone the email address and password to login anyway—and then they could still modify or delete your account. So unless you are the ONLY person who ever has access to your page, you’re always going to be a bit at risk. Login to your own personal Facebook account. Create your page. 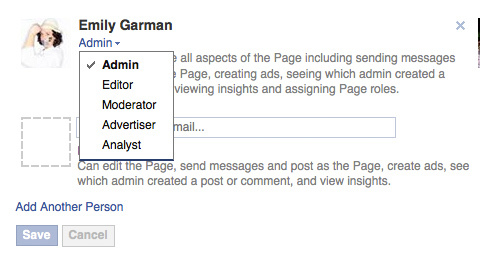 You will be the “Admin.” Then you can add other people (via their own personal Facebook accounts) as various levels of administrator—there are Admin, Editor, Moderator, Advertiser and Analyst levels, each with various levels of permissions and abilities on the page. As long as you give other people lower admin privileges than yourself, they will never be able to remove you or any other user from the page. This protects your page and your autonomy, but allows other people to help you manage the page. Can I change our existing organization Facebook to a Business account or disconnect my personal page? If you’ve set up your business/organization on Facebook as a profile (which is intended for personal use only), you CAN convert it to a page. This post explains how to convert a Facebook profile into a page. If you’re wanting to simply remove your own profile as an admin from your page, though, I would advise against this for the reasons explained above. You CAN remove yourself as an admin, but if all admins are removed from a page, then the page will have no administrators. You will not be able to manage it, to re-add yourself as an admin, or remove the page. This is a HUGE problem for many organizations. It’s pretty much impossible to contact Facebook and have them restore you as an admin, or remove the page. So you essentially have an “orphan” page with no admins that you can’t manage or remove. If you then created a new page for your organization (which would be your only option at that point), it would be very confusing to people searching for your page. They’d find your old, orphan page first (having seniority, it would always show up first). Remember, there’s no problem with having other admins on the page via their own personal accounts, as long as you make them a lesser admin level than yourself. Visitors to your Facebook page will never see any information about who the admins are on your page, unless you wish to show that information publicly. If your concern is that you want someone to have admin privileges on your page, but that person doesn’t have a Facebook account, and they don’t want to create one, then frankly, that person shouldn’t be an admin on your page. If they aren’t using Facebook themselves, and don’t want to, then they really aren’t qualified to be an admin on your page! Make sure your page is created by you, logged in under your personal Facebook account. By creating the page, you are the main Admin. Add other Facebook users (via their names, if you’re “friends” on Facebook, or via their email addresses, if you’re not). Make sure to assign them an administrator level that is lesser than your own—that way you always retain ultimate control over the page. Please let me know if you have any questions about this! I’m here to help. By the way, here’s Facebook’s help page on the topic of Page Roles.